CORO vintage brooch with faux pearls and baby blue glass accents. Vintage Giovanni enamel rose brooch and two metal faux pearl and clear beads floral brooches. Disney Minnie and Winnie the pooh with piglet set of two brooches. NOVIKA brooch, tennis racket with clear rhinestones in shimmering gold tone color. Large and sparkly costume jewelry brooch with multi color beads and faux pearls. Equestrian, horses, theme shimmering gold tone vintage dangle brooch. Vintage Sarah Coventry Scarecrow Brooch 1960, sign. Large shimmering gold tone costume jewelry brooch with faux pearls accents. Satin gold tone vintage round brooch with crystal clear beads and faux pearls accents. Gold tone metal and enamel colorful Butterfly brooch. Vintage costume jewelry set of two brooches in floral multicolor and pink round design. Shimmering gold tone ribbon swirl textured vintage brooch. Vintage cat and dog silhouette brass color on metal animal brooch. M. JENT 1970 cut-out ribbon and faux pearls brooch in shimmering gold tone. Vintage Butterfly with colorful beads accent brooch and pendant in one. Beautiful enamel and gold tone metal floral vintage brooch in white, green, and yellow color design. Vintage Cameo brooch on looped leaves, 1/20 12K GF. Elegants set of two brooches in great gold tone metal with Zebra and floral wreath design. Multi color beads metal flower accent vintage brooch for any occasion. Large BSK vintage brooch in blooming flower design with clear glass beads and faux pearl in elegant statement design. Hollywood Regency style beaded with faux pearls vintage statement Brooch in multi color floral detailed design. Sarah Cov satin and shimmering gold tone textured geometric floral brooch. Sarah Cov statement elegant dome shaped brooch in round floral design with mother of pearl like center. Vintage Roadrunner brooch by Ambassador and two finches on a branch brooch. Amazing Folk Art Safety Pin Brooch with handmade wooden nesting figurines dangles. 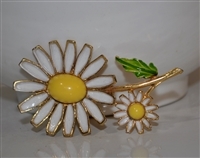 WEISS enamel daisy brooch. Large Daisy flower in colorful enamel finish. Vintage MONET long bobble domes satin gold color brooch and Twisted ribbon heart brooch with faux pearl set of two brooches. Elegant vintage dome shaped Brooch with wavy ribbons and multiple faux pearls. Vintage Van Dell gold plated rose brooch and Coro gold tone clip on earrings set, costume jewelry.